I am a solo traveler whether it be abroad or right here in the Los Angeles area. I was looking for a nice quiet place to enjoy nature and that’s exactly what I found. The park had picnic tables, grassy areas, and lots of shade trees. One of the major draws of the park is the lake in the center that is fed by a natural spring. 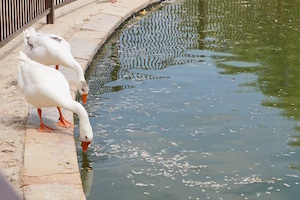 It is home to geese, ducks, and many species of birds. For the adventurous, there is duck food for sale. I say adventurous because the birds are used to people feeding them and will crawl under the fence and come right up to you. Standing upright, some of the geese are the size of a small child. The park is available for space rental for birthday parties and events. You can also explore the buildings on the premises, which are chuck-full of historical facts about its lineage and the people who have owned the ranch from inception until it was turned into a state park. 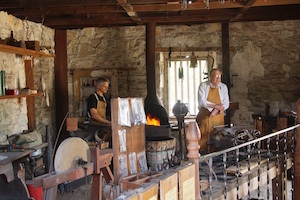 On the third Sunday of the month the blacksmith shop is open. It is an actual working blacksmith shop and I had the pleasure of observing tools and nails in the making. As a soloist this is the perfect place to sit and read, observe nature, and power down. Instead of being on your smartphone on Twitter, you can actually listen to birds “live tweet.” While there were people there, at no time did it feel crowded or that you couldn’t carve out your own little piece of paradise.